In 2011, Americans will devote 2 hours and 13 minutes of every eight-hour workday, or over a quarter of their working hours (27.7%), to paying taxes. In a nine-to-five workday, it takes until 11:13 a.m. to earn enough to pay that day’s share of taxes at the federal, state and local level. If we add the federal deficit to the picture—that is, if the federal government were planning to collect enough in taxes during 2011 to finance all of its spending—Americans would work until lunchtime, 12:07 p.m., for the government, before keeping any of their earnings for themselves. 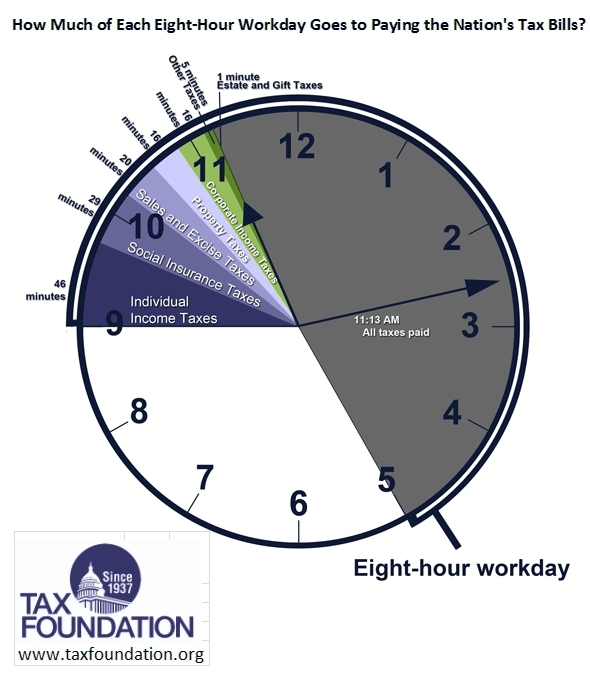 The Tax Bite in the Eight-Hour Day®, which measures the nation’s tax burden in hours and minutes, is an offshoot of the Tax Foundation’s annual Tax Freedom Day® calculation, which measures the tax burden in months, weeks, and days. These calendar- and clock-based measurements help to explain how much the nation as a whole spends on government. Both Tax Freedom Day and the Tax Bite in the Eight-Hour Day illustrate, in similar ways, what portion of their income Americans keep for themselves and what percentage they spend on government. Both measures have long been some of our most popular research. Tax Freedom Day was conceived by Florida businessman Dallas Hostetler in 1948. He per­formed the calculation himself and promoted his copyrighted concept until his retirement in 1971. He deeded the intellectual property to the Tax Foundation, which was publishing the Tax Bite in the Eight-Hour Day at the time. Since then the Tax Foundation has used historical data to calculate both Tax Freedom Day and the Tax Bite in the Eight-Hour Day. Find out how long residents of your state have to work to pay their tax bills.